HDMI Cables are audio and video cables that connect your devices. In a high definition format, HDMI Cable transmits uncompressed digital data for display & other high definition devices. HDMI Cable provides high definition video with bandwidth to spare for the next generation of HD equipment, whilst avoiding interfering with the picture quality of which standard TV components are not able to offer. Components connected using HDMI Cables have system intelligence where they have the ability to query the capabilities of each other’s devices and make adjustments automatically & where necessary in order to ensure viewing is optimised. 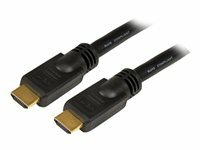 Our range of high speed HDMI (High-Definition Multimedia Interface) Cables are designed & manufactured to ensure both high quality & high definition performance, through using high quality materials. 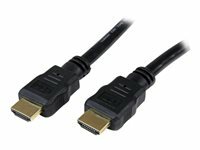 Combining high bandwidth video and multi-channel digital audio into a single cable, the HDMI Cable standard provides crystal clear image resolution. Through this, a single cable can replace up to eleven older cables which in turn makes your systems and devices easier to connect as well as being easier to upgrade. This level of elegant simplicity cannot be found in any other connection. 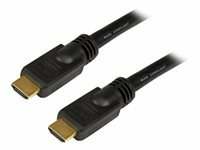 We supply a high quality range of HDMI Cables from StarTech.com which fully support 1080p+ resolutions at a refresh rate of up to 120HZ, with life-like colour. In order to accommodate the demands of future high definition devices which include increased resolutions and higher frame rates, these ultra HD HDMI Cables support higher resolutions of up to 4k x 2k. Buy 7-15 meter HDMI cable and receive Free Delivery when you buy online at Comms Express. View our other HDMI & Audio, Video Equipment ranges available at Comms Express. Create Ultra HD connections between your High Speed HDMI-equipped devices. The HDMM5M High Speed HDMI cable (5m/16.4ft) features 2 gold-plated HDMI (male) connectors and durable high quality construction to provide a dependable HDMI to HDMI connection between devices such as Blu-Ray Disc players, HDTVs, DVD Players, stereo receivers, projectors and more.This high quality HDMI cable fully supports 1080p+ resolutions at up to 120Hz refresh rate, with life-like color. To accommodate the demands of future high definition devices, such as increased resolutions and higher frame rates, this Ultra HD cable supports resolutions up to 4k x 2k.StarTech.com High Speed HDMI digital video and audio cables are expertly designed and constructed of only top quality materials to ensure high quality, high definition performance. The HDMI standard combines high bandwidth video and multi-channel digital audio into a single cable, and provides crystal clear image resolution.This is a replacement product for StarTech.com's 15 ft High Speed HDMI Cable - HDMI- M/M (HDMIMM15).